This is one of my favorite original designs so far. I absolutely love it because it defines perfectly what I want to do with my DesiMakes designs. 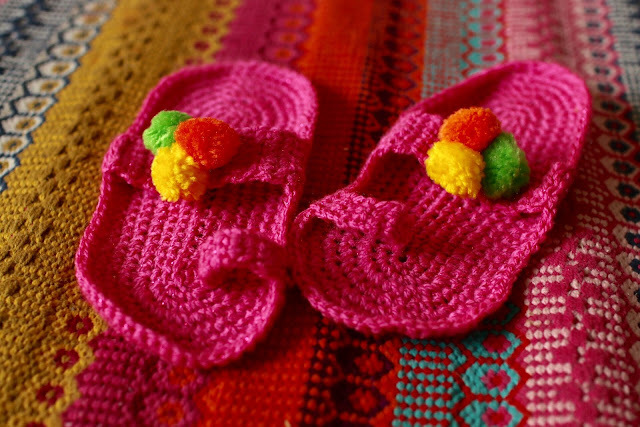 It is a quintessentially Indian look and it is a fairly simple crochet pattern as well. I used some really bright colors which attract me immediately. The Kolahpuri chappals are something which I have worn a lot in India growing up. The weather in London is not that practical for wearing these outside for most of the year but they are perfect for house slippers. I will definitely make these again and probably add a sole of some kind so that I can wear these outside in the summer. I just used a pink DK yarn for this and it turned out perfectly well. round 5-7: dc in each st all around. Repeat step 2 , 9 times. Slip Stitch the thumb to the sole 4 sts across from the edge. Fasten off. From thumb rest, count 6 stitches down. Repeat step 2, 20 times or as per the fit of your feet. I actually put the slipper on my foot at this time and checked for the fit. Slip stitch to the other edge across to complete the slippers. Fasten off. Attach 3 pompoms of different bright colors in the middle of the strap. Now strut around in your colorful slippers! Capelet for the Best Mom in the World! © Desi Makes | All rights reserved.